Ten days, eleven states (6): The mighty Mississippi, or is it? | A balanced diet . . . Ten days, eleven states (6): The mighty Mississippi, or is it? It’s not even the longest river, as such, in North America. From its source at Lake Itasca in northern Minnesota (that we visited in 2016) until the Gulf of Mexico, the Mississippi is 2320 miles long. The Missouri, on the other hand, which joins the Mississippi near St Louis, MO, flows eastwards for 2341 miles from its source high in the Rockies of western Montana before it reaches that confluence. One of the other main tributaries of the Mississippi is the Ohio River, at a mere 981 miles, yet its flow is much greater than the Mississippi, and at its deepest point, near Louisville, KY, it is over 130 feet deep. That’s some river! 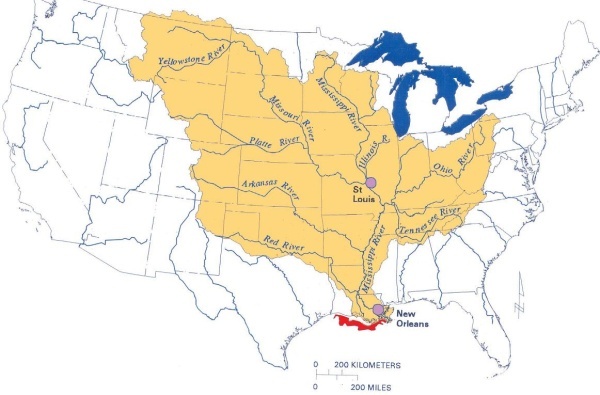 The Mississippi and its tributaries drain almost half the land mass of the the United States. The Ohio joins the Mississippi at the southernmost point of Illinois, Fort Defiance, just south of Cairo, an almost abandoned town that looks like it has suffered one flooding event too many over the years. Cairo was, apparently, the prototype for Charles Dickens’ ‘City of Eden’ in his novel Martin Chuzzlewit (which I read recently as part of my 2017 Charles Dickens challenge) published serially between 1842 and 1844. Dickens visited the USA in 1842. He was not impressed with Cairo; neither were we. We left Cave City, KY just before noon on the Wednesday (Day 8 of our road trip), heading to Troy, IL, and then to follow the Mississippi north through Missouri, Iowa, and southern Minnesota to St Paul. This is our route from Cave City to Iowa City. 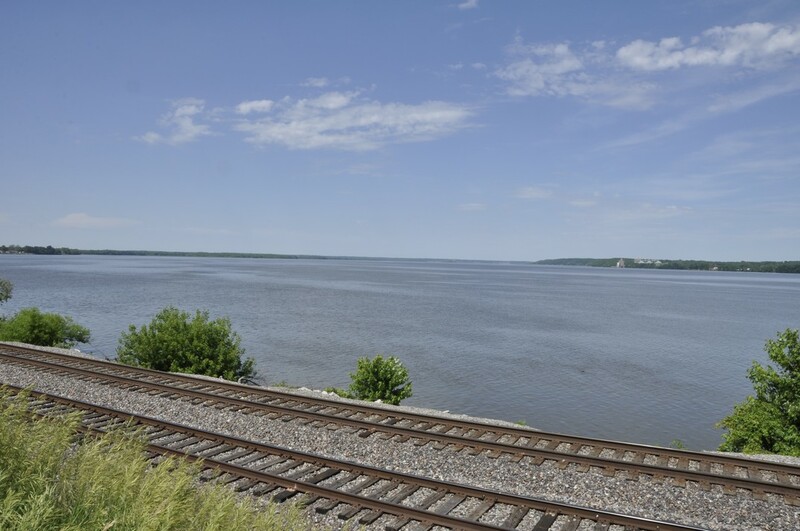 Before reaching Fort Defiance, we had already crossed the Tennessee River, which joins the Ohio River near Paducah, KY. Just before Paducah, we turned west and reached the banks of the Mississippi at Wickliffe, just down river from the confluence. There are two impressive bridges crossing the Ohio and Mississippi. Seeing the enormity of these constructions makes you really wonder at how much an obstacle these rivers were during the westward expansion of the settlers in the 18th and 19th centuries. 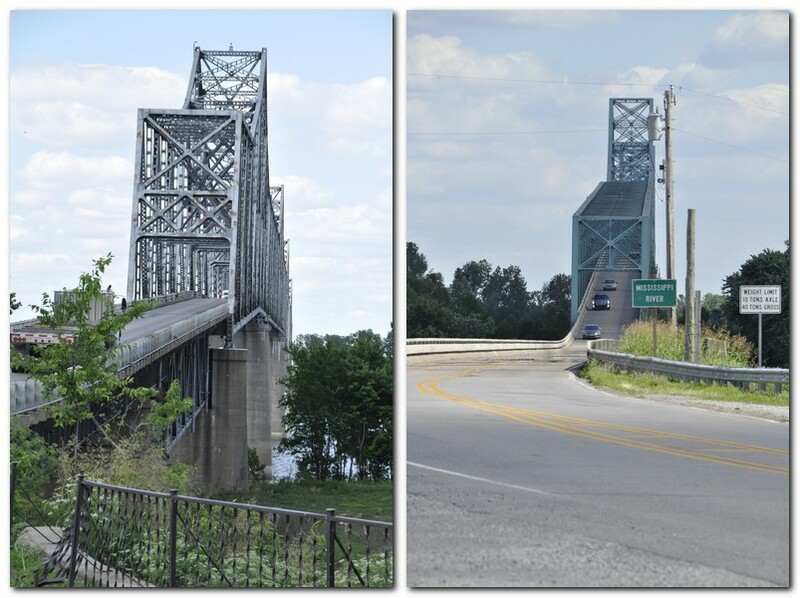 Today the Mississippi alone boasts more than 130 bridges along its length. 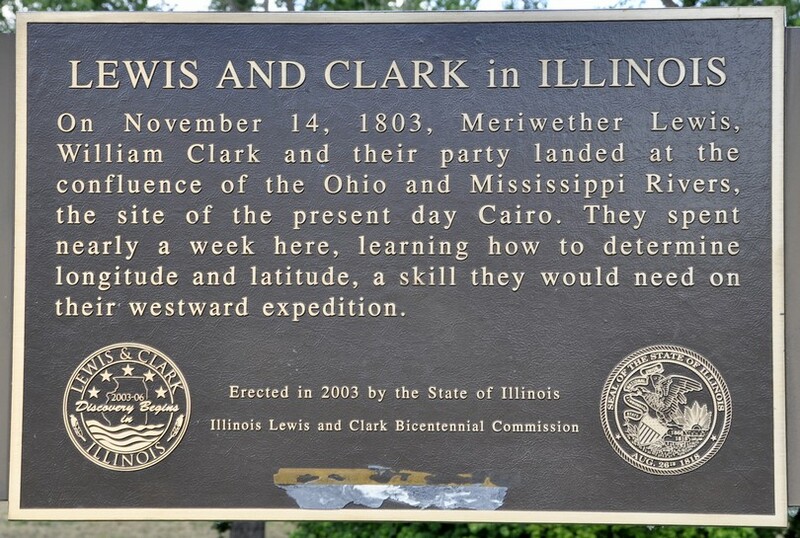 Explorers Meriwether Lewis and William Clark camped here in 1803, and it was a strategic location during the Civil War, for obvious reasons commanding the approaches upriver to both the Ohio and Mississippi. River selfies! We are standing at the tip of Fort Defiance, the southernmost tip of Illinois. Top: the Ohio River, with Kentucky on the far bank. Middle: the confluence of the the Ohio and Mississippi, looking south, with Kentucky on the left bank, and Missouri on the right. Bottom: the Mississippi River, with Missouri on the far bank over the Cairo Mississippi Road Bridge. 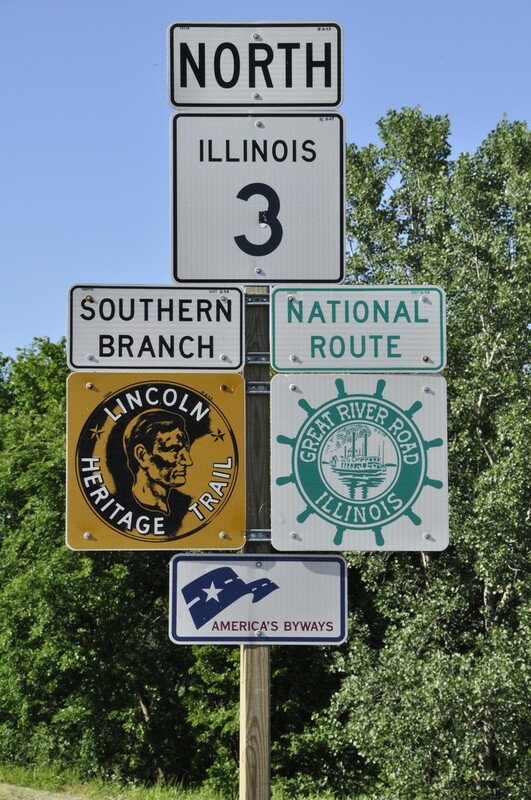 Leaving Fort Defiance, we headed north along the Mississippi, on IL3 until Red Bud, when we headed north and skirted around St Louis to the northeast to reach our next stop at Troy, IL. The following day, the penultimate one of the trip, took us from Troy all the way north to Iowa City, mostly along the banks of the Mississippi. I can’t deny I faced the 43 miles from our hotel on I-270/70 around the north of St Louis with some trepidation. Although it wasn’t quite as busy as I had feared, there was some careful navigation and changing lanes constantly to ensure we headed out in the right direction. Eventually we reached our exit and headed north on MO79, having crossed the Mississippi to cross into Missouri, and then the Missouri River. Just over 40 miles north from where we left I-70, the road ran parallel to the Mississippi, and just a few meters away. Having been on the road for a couple of hours, and looking for the inevitable comfort break, we stopped in the small community of Clarksville. There’s a lock and a dam at this point on the Mississippi, and just at that moment a large grain barge (probably empty) was moving through on its way north. Clarksville has been flooded many times, and some of the riverside properties looked as though they wouldn’t be able to sustain yet another one. 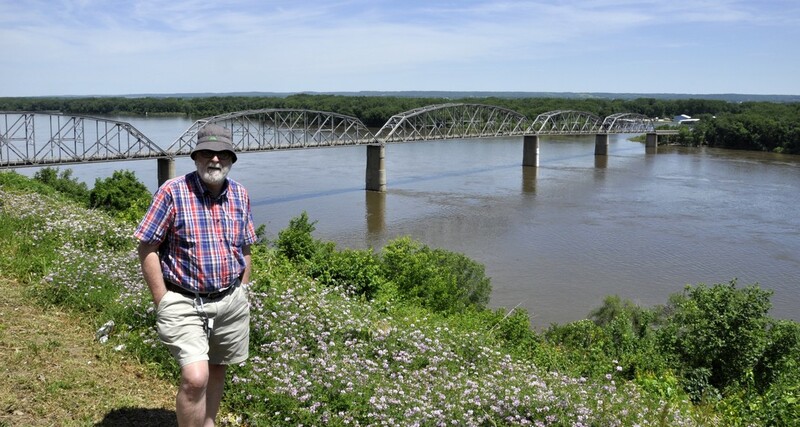 At Louisiana, MO (about 36 miles north of Clarksville) we stopped to view the Champ Clark Bridge from a high vantage point. Built in 1928, this bridge no longer has the capacity for the traffic on US54. By the end of 2019 a new and wider bridge will be in place. In southern Iowa, north of Montrose, we were reminded once again of the great migration westwards, of pioneers seeking a better life, in this case Mormons heading to Utah. In 1846, Mormons were hounded out of Illinois just across the river, at Nauvoo. The river is well over 1 mile wide here. A bystander told us that the white building on the opposite bank in Illinois was a Mormon temple, now abandoned. We turned inland at Muscatine, IA to spend our last night at Coralville, a suburb of Iowa City. The following morning, we continued our route north across Iowa: flat, rather boring landscape, and mile upon mile of maize. Once we crossed into Minnesota, we turned northeast to Winona and the Mississippi once again. To the west of the town, there is access to Garvin Heights Lookout, some 500 feet above the river. What a view, north and south! In this stretch of the river, it forms a series of wide lakes. 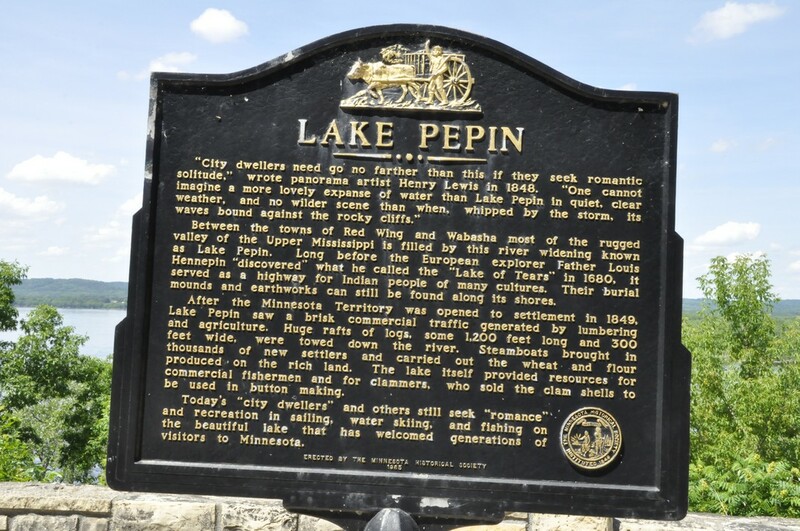 North of Winona, we stopped briefly to view Lake Pepin. Then it was time to push on, and complete the final 63 miles of our epic road trip via Red Wing and Hastings, MN. Leaving the Mississippi at Hastings and pushing westwards to wards St Paul, we finally arrived at the home of our elder daughter Hannah and her family alongside the Mississippi in the Highland area. The final three days were certainly a Mississippi adventure, although I never aspired to be a latter-day Huckleberry Finn. The video below covers the final three days of our trip from Fort Defiance to the Twin Cities. This entry was posted in Out and about, Travel and tagged Fort Defiance, Illinois, Iowa, Kentucky, Minnesota, Mississippi River, Missouri, Missouri River, Ohio River, Tennessee River, USA.